in Australia's National Capital where, during the apple season, you can drive through our orchard to our apple shop, and buy freshly-picked fruit. Because we pick and sell our fruit when it is at its peak there are times when we sell out and are, temporarily, closed. See below for the current situation and what we are selling. Opening hours 9 - 5.30. We are NOT a pick-it-yourself orchard. 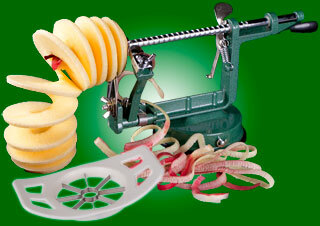 Our apple peelers convert an apple into peeled, cored. slices in seconds and you can process a case in no time. Email us to buy one - $15 from the farm or $24 posted.. We also stock spare parts. Click here for more details. For years we have been collecting, and trying, apple recipes. We also have accumulated pear and quince recipes. If you would like to see them email us at: ken@kerrisonsorchard.com.au. No charge. Pialligo, where Kerrison's Orchard is located, is a semi-rural area barely 5 kilometres from Australia's Parliament House. It is one of the earliest European-settled areas of Australia. Robert Campbell settled in Pialligo in 1825 - only 38 years after the arrival of the First Fleet in Sydney (and 13 years before Queanbeyan was established). Robert Campbell was a merchant and a politician - a member of the first NSW Legislative Council. He named his property Duntroon after his family estate in Scotland. In 1911 the property became the site of the Royal Military College - (established on the recommendation of Lord Kitchener). In the 1930s, under the Burley Griffin plan, land was released in Pialligo for small horticutural enterprises to serve Canberra. (Griffin talked about 'truck farms'). Phone 02 6257 4460 (but we are farmers and email is best).